What comes to mind when you hear the term “open source”? Hopefully, it means more to you than just a software application running on a PC. As an embedded systems developer, you should familiarize yourself with the wide range of open-source programs, programming tools, and hardware platforms currently available. In addition to saving yourself the costs of pricey user licenses, you’ll find that open-source community forums helpful, informative, and engaging. Open-source software offers a number of advantages. The product is independent of a particular manufacturer and there aren’t license costs. Plus, the product is usually high quality because it is often supported by a large active community of users. When a program’s source code is available, you have the chance to fix errors, change its behavior, and even add new features. The aforementioned advantages should be good enough reasons for any designer of microcontroller applications to work with open-source software. PC tools such as editors, documentation programs, toolchains (for the vast majority of microcontrollers), operating systems, and libraries are widely available with open-source code. On the hardware side, open-source microcontroller boards are gaining popularity among serious engineers. The circuits, PCBs, and CAD files are available so you can modify them, improve them, and add more features to meet the demands of your applications. It’s an added benefit that open-source hardware is always supported by software code and libraries that enable you to get up and running fairly quickly. Since we couldn’t include in the space provided all the open-source resources currently available, we simply list several open-source projects that Elektor and Circuit Cellar engineers and editors recommend. Below we provide the following lists: hardware; libraries and run-time tools; PC tools, and GNU toolchains. By no means are the lists complete. Still, they’re helpful starting points. 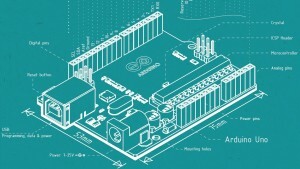 Arduino—This popular platform offers a range of simple microcontroller and development boards that you can purchase from several suppliers. The Arduino website has an active forum and the wide range of software examples will ensure that you are up and running in minimum time. Openmoko—It’s a complete software stack for a smart. The Neo FreeRunner mobile phone is the target hardware platform. Development and debug boards are also available. GNU Radio & Universal Software Radio Peripheral—The GNU Radio project is a software toolkit to produce a software-defined radio. The open-source hardware for this project is the Universal Software Radio Peripheral (USRPBoard), which is based on an FPGA. KiCAD—One of the best-known suites of CAD programs for hardware production, KiCAD includes tools for generating circuit diagrams and PCBs. You can view 3-D representations of the finished board. Fab Lab—This interesting project offers 3-D laser cutters, 3-D printers, and other machines for use by the general public. It’s a handy resource for making robot parts and art objects. uIP/lwIP—Two outstanding network stacks, the first is for 8-bit microcontrollers. lwIP is a development of the first and more suited to medium sized controllers. The uIP licence is not so strict allowing the stack to be used in commercial products. Crypto-avr-lib—It’s a library of optimized cryptographic routines for the Atmel ATmega controller. Issued under the GPL Version 3 licence. Contact the author for other types of licence. FreeRTOS—FreeRTOS is a lightweight Real Time kernel which can run on many controller families. It can be used in commercial applications and allows the use of closed-source software. U-Boot—Universal bootloader with a large range of routines for memory, UART interface, SD card, network and USB etc. Conceived originally as a bootloader but now through comprehensive hardware support can be used as the basis of a C code module. Embedded Filesystems Library—A useful (FAT) file format, when you are short of memory. The GPL licence includes a clause allowing static linking to the library without public disclosure of your code. .NET Micro Framework—Now open source this very compact, trimmed down .NET Framework running on diverse ARM platforms. Programmable using the object orientated C variant C#; lots of resources including support for I2C, Ethernet and many more. Helps reduce development time. Eclipse—This is a good development environment. It has a modular structure which makes it very easy to configure. There are around 1,000 plug-in modules (both open source and commercial) for a range of program languages and target systems. Kdevelop—Kdevelop is an integrated development environment which should satisfy most power-user needs. Runs in MS Windows, Mac OsX, Linux, Solaris and FreeBSD. Plug-in expandable. Programmer’s Notepad—A lightweight but efficient editor for writing source code. Allows fast, simple and comfortable program production. Can be expanded with plug-ins. Doxygen—An intelligent tool which can automatically generate code documentation (C, C++, Java etc.). The programmer provides tags in the source file; Doxygen generates the comprehensive documentation in PDF or HTML format. It can also extract the code structure from undocumented source files. WinMerge—A good tool for code comparison and code synchronization. The program can also compare the contents of folders/files and display the results in a visual text format that makes it easy to understand. Tera Term—A terminal program to access COM ports, supports Telnet communication Protocol. A debugging tool to eavesdrop on serial communications. Note: Toolchains for GNU projects are available most processor architectures AVR, Coldfire, ARM, MIPS, PowerPC and Intel x86. The GNU-toolchain includes not only compilers for C, C++ and in most cases also Java (GCC = GNU Compiler Collection), but also Linkers, Assemblers and Debuggers together with C libraries (libc = C library). The tools are used from within other-open source projects, like WinAVR, which provides a familiar user interface to speed up program development.